Mental Health First Aid is an 8-hour training course designed to give members of the public key skills to help someone who is developing a mental health problem or experiencing a mental health crisis. The evidence behind the program demonstrates that it does build mental health literacy, helping the public identify, understand and respond to signs of mental illness. Working knowledge of the appropriate professional, peer, social, and self-help resources available to help someone with a mental health problem treat and manage the problem and achieve recovery. Mental Health First Aid is a 12-hour training course designed to give members of the public key skills to help someone who is developing a mental health problem or experiencing a mental health crisis. The evidence behind the program demonstrates that it does build mental health literacy, helping the public identify, understand and respond to signs of mental illness. How many days does it take to complete the Mental Health First Aid program? The Mental Health First Aid program runs 8 hours and most often, is conducted as one-day seminar but can be offered in a variety of formats. What do Mental Health First Aid training participants learn? Just as CPR training helps a layperson with no clinical training assist an individual following a heart attack, Mental Health First Aid training helps a layperson assist someone experiencing a mental health crisis, such as contemplating suicide. In both situations, the goal is to help support an individual until appropriate professional help arrives. Mental Health First Aiders learn a single 5-step strategy that includes assessing risk, respectfully listening to and supporting the individual in crisis, and identifying appropriate professional help and other supports. Participants are also introduced to risk factors and warning signs for mental health or substance use problems, engage in experiential activities that build understanding of the impact of illness on individuals and families; and learn about evidence-supported treatment and self-help strategies. What types of crisis interventions are covered? Trainees are taught how to apply the 5-step strategy in a variety of situations, such as helping someone through a panic attack, engaging with someone who may be suicidal, or assisting an individual who has overdosed. An important component of the Mental Health First Aid training is the opportunity to practice the intervention strategy rather than to just learn about it. This simple experience can make it easier to actually apply the knowledge in a real-life situation. Who should take a Mental health First Aid course? 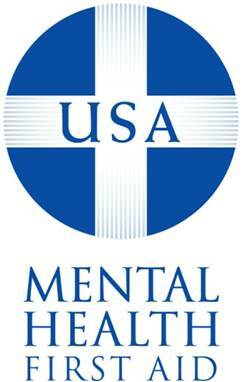 Mental Health First Aid is intended for a variety of audiences: friends and family of individuals with mental illness or addiction, key professionals (such as police officers, human resource directors and primary care workers), school and college leadership, faith communities, or anyone interested in learning more about mental illness and addiction. The training venues will also vary as Mental Health First Aid program sites reach out to Chambers of Commerce, professional associations, hospitals, nursing homes, Rotary Clubs, parent organizations, social clubs and other groups who make up the fabric of a community. The core program is tailored for response to the general adult population. Is there evidence to support the effectiveness of the program? Yes, in fact, the strong evidence base is the very reason the National Council selected this particular program. Five published studies in Australia show that the program saves lives, improves the mental health of the individual administering care and the one receiving it, expands knowledge of mental illnesses and their treatments, increases the services provided and reduces overall stigma by improving mental health literacy. One trial of 301 randomized participants found that those who trained in Mental Health First Aid have greater confidence in providing help to others, greater likelihood of advising people to seek professional help, improved concordance with health professionals about treatments, and decreased stigmatizing attitudes. Unexpectedly, the study also found that Mental Health First Aid improved the mental health of the participants themselves. What is covered in Mental Health First Aid?